The Christ Grid, better described as the Christ Consciousness Grid, has nothing to do with any particular religion, despite its name. It is in fact a geometric representation of the interconnectedness of Planet Earth, the Cosmos and all human consciousness. The term, Christ Consciousness, is defined as the realization of our Divine self. It is the state of Enlightenment – of understanding the Universal Truth. It is the point where we no longer perceive our self as separate from anything or anybody else, but rather as an aspect of the Creator of the Universe, and indeed inseparable from the Creator. The dodecahedron and icosahedron are combined to form a spherical grid of 72 facets, which encompasses the Earth. The Christ Consciousness Grid is the energy network through which we, when attuned, may unify with the global human consciousness. It allows us to access the knowledge and wisdom of the entire human experience, of those living in the past and present, and even including our own earlier incarnations. As certain intersections of the grid coincide with energy power spots on the Earth that are recognized as sacred sites, the grid also allows us to integrate with the ancient knowledge of the Earth and the Cosmos. Full integration leads to the state of Christ Consciousness. Another way to understand the grid is to consider the significance of its separate parts. The dodecahedron, with its 12 pentagons, represents unconditional love, which on its own will not lead to self-realization. 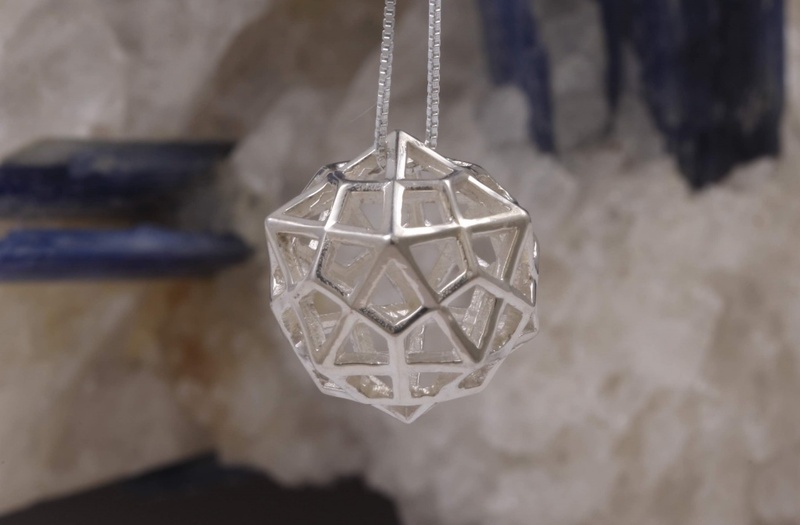 The icosahedron, with its 20 triangles, represents the three characteristics of mindfulness – impeccability, self-responsibility and integrity. When a physical dodecahedron is integrated with an icosahedron, it is rendered physically stronger and more stable. So too the quality of unconditional love is turned into a strong and stable force for self-realization and the unification of consciousness, when integrated with mindfulness. It is also interesting to note that there are 72 facets in the structure of a physical Christ Consciousness Grid. This corresponds with the 72 names – or manifestations – of God mentioned in the Old Testament (specifically in the section describing the parting of the Red Sea). It is as if to say that in achieving unified consciousness on a human, planetary and cosmic level, we also come to know and understand these 72 manifestations of God. Blue Turtles’ Christ Consciousness Grid pendant is crafted from sterling silver and measures 20 mm in diameter. 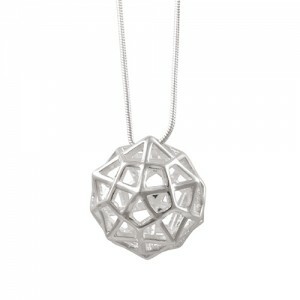 To purchase the Christ Grid Pendant or find a stockist, click here. Some of this information was derived from the writings of Ronald L. Holt, the world director of the Flower of Life organization. The images of the dodecahedron and icosahedron are thanks to Cyp.